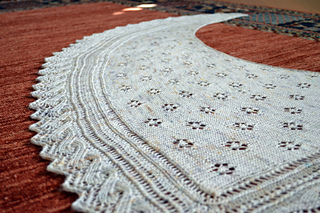 Approximately 60” [152cm] wide at lower edge and 26” [66cm] tall at high end, after blocking. 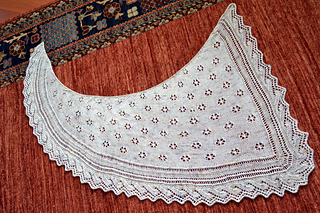 This shawl was exclusive for 3 months to a kit sold around Winter times. Thus the name: Winter Dreams. 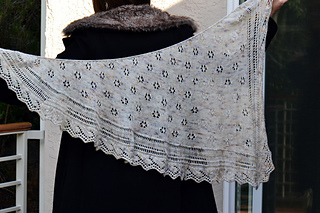 Inspired by Winter landscapes, this asymmetrical shawl combines a beautiful border that is reminiscent of a little stream while the body of the shawl is worked in the gentle pattern of little frozen flowers spread over the Stockinette field. 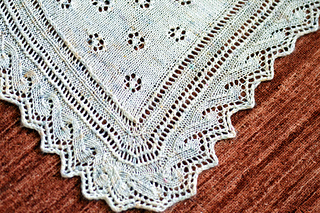 The border is first worked concurrently with the main portion of the shawl and as it turns it joins the rest of the shawl. No sewing is required. Yay! !